This recipe is one of my favorites to make when I’m craving something sweet, decadent, and full of fall flavors. Not to mention how good it makes the house smell! Since it’s mostly carbohydrates and fat and has a little protein, enjoy half of it as dessert after a meal composed of lean protein and vegetables to keep it balanced and stabilize your blood sugar. It’s also great to have as breakfast if paired with a side of protein such as scrambled egg whites, Greek yogurt, or a protein shake. Make sauce by combining yogurt and pumpkin puree in a small bowl. Set aside. Lightly spray both sides of tortilla with cooking spray. In a small bowl, combine 1/2 tsp granulated sugar and 1/4 tsp cinnamon. Place tortilla in a non-stick skillet over medium-high heat and sprinkle with cinnamon-sugar mixture. Allow to toast for 5 minutes, then flip it over with spice side down. Toast for an additional 3-5 minutes or until sugar is caramelized. Flip it over again, remove from skillet, and place on a plate. 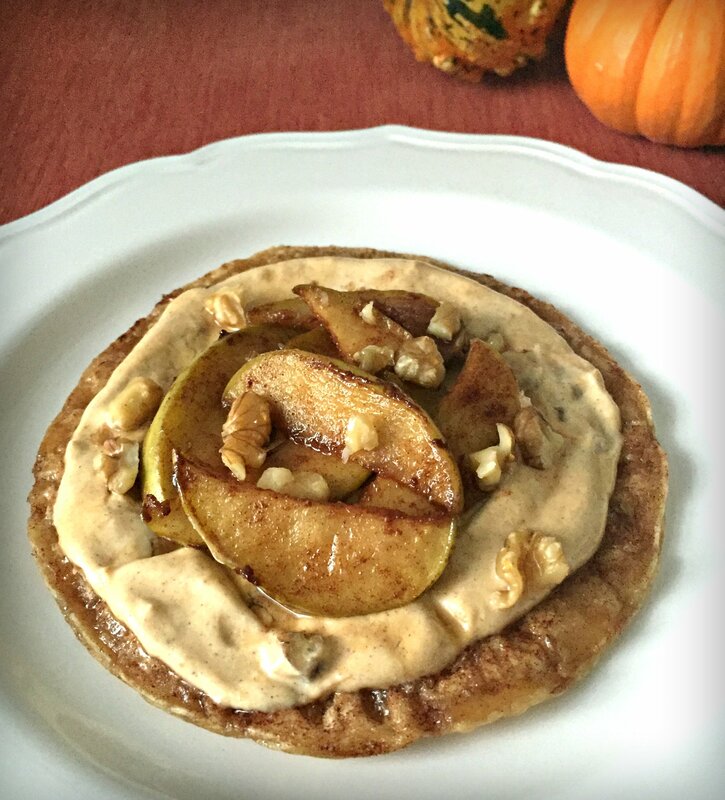 To assemble, spread yogurt sauce on tortilla and top with warm caramelized apples and walnuts.